This Post was posted in Aero Painting and tagged Aero-Painting, Australian Flying Corps, Barnwell Brothers, Bristol Fighter, Bristol Scout, BSA Gold Stars, Frank Barnwell, Steam Locomotives, the Caledonian and Highland Railways. Bookmark the permalink. I really like your ‘Biff’ painting Al. I don’t think it requires much more, other than finishing off the pilot and a wee bit of tonal work on the dark, lower front wing as it looks a wee bit flat – needs a bit more dimensional depth. 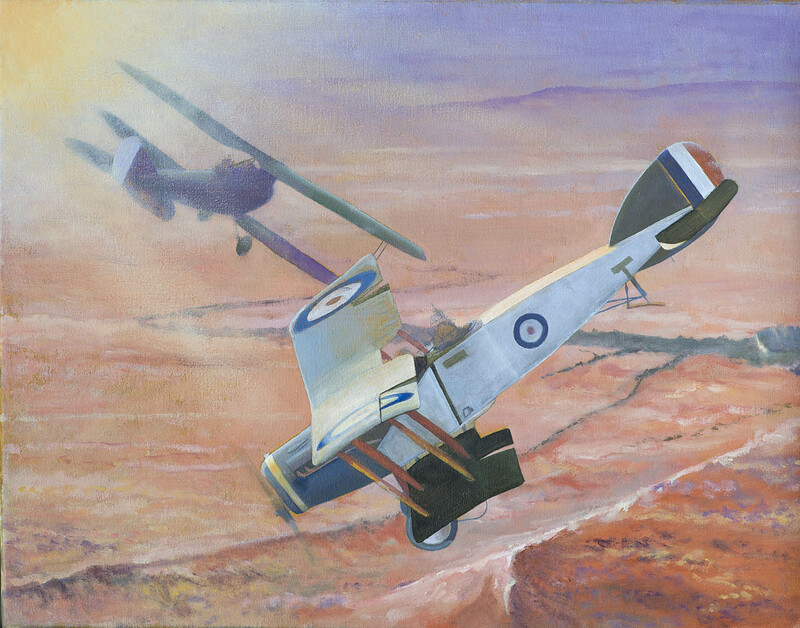 I really like the hazy finish of the Rumpler against the sun rays, it doesn’t need more detail and it adds a lot of atmosphere to the overall painting. Cheers Ron. Lots to do I think – but subtly, so it doesn’t LOOK like it!